✓ This high-powered air fryer has a temperature control range that allows you to air fry your food between 180 and 390 degrees fahrenheit, so that you can get the perfect cook and crispness on whatever you are cooking. ✓ This air fryer comes with some handy accessories which includes a rack, skewers, and a top grill so that you can prepare just about anything that you could imagine. 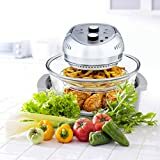 These accessories give you the power and the ability to make food faster and healthier than you than when you are comparing it to a traditional fryer. When it comes to preparing a solid, healthy, home-cooked meal, we all love them. The issue is that we don’t always have the time to set aside for cooking. That can lead us to reaching for quick-fixes and unhealthy options which can slowly or quickly drag down your health. So the question is, how do you indulge in fried and fatty foods without taking in all those low-quality calories? Can you save time and calories while still enjoying the fried food flavor and texture that you love? Air fryers are an incredible substitute to traditional frying, and can serve the twofold purpose of helping you save time in the kitchen while preparing healthier food. 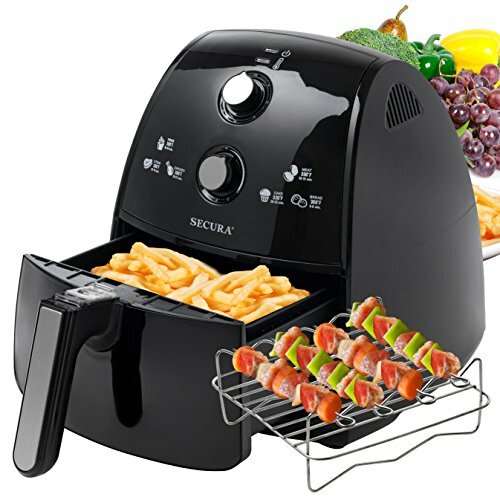 In terms of finding an air fryer that gives you a healthier way to cook and prepare some of the unhealthy foods that you love, that air fryer from Secura will do the job. 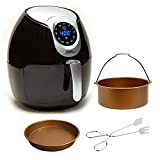 This model of air fryer has a large 4 liter capacity that is plenty enough space for preparing a variety of different foods, whether they be frozen or fresh. The added products that come with this fryer, including the top grill, rack, and skewers give you an even broader spectrum for what you can cook and prepare with this handy and convenient air fryer. This air fryer is designed so that you can enjoy the crispness of perfectly fried food without having to cook your food in oil. Other benefits of air fryers include less mess and no smell comparing to using traditional deep fryers. 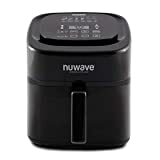 This air fryer is perfect for anyone who has a health conscious diet but still wants to enjoy the flavor and incredible taste of fried foods. Let’s take a deeper look into the key features that this air fryer has to offer you. The first thing that you will love about this air fryer is the large capacity that it offers. The 4 liter basket that comes with this air fryer provides plenty enough room that you can cook for a small family. Plus, the air fryer cooks your food quickly enough that if you need to prepare more food, you can simply prep your first batch, reload the basket, and set the time and temperature for your next batch. All of the added features and materials that are included with this air fryer. It comes with the 4 liter basket, skewers, a top grill, and a toaster rack so that you can cook and prepare just about anything. This fryer even comes with a recipe book that you can use to get started with air frying. One of important things you should consider when shopping for an air fryer is temperature range. This air fryer gives you the ability to cook a variety of different foods, over a large temperature range. There are two different dials on this particular model that include a selection dial for temperature and another for the time that you need to cook your food. The temperature that you can cook your food at ranges from 180 to 390 degrees fahrenheit. That gives you the ability to cook in a lot of different ways that span from roasting meats, to cooking frozen french fries and baking bread.